Seismic event indicators say Earth has passed the peak of the first earth-change uptick period for the 2018 Earth orbit cycle relative to the Black Star positioned in the Libra Constellation relative to the Sun. Year-over-year weekly seismic-event values for Week 13 show one 8-magnitude quake (2014) and two of the 7-magnitude earthquake events (2014, 2015) for the last five orbit cycles. The 2016 event values are extremely low, because the nearside-alignment quake event (7.0 Vanuatu) came in Week 12 a week early. We are looking at a similar situation for 2018 with the 6.9 Hawaii Quake (May 4) where Jupiter in Libra (info) appears to be playing a key solar-system-harmonics role. Week-over-week seismic-event values for Week 13 show no 7-magnitude earthquake events for eleven weeks in a row, which is another sign that Earth is following the 2017 seismic pattern. Earth saw three of the 6-magnitude quake events Week 11 (including 6.9 Hawaii), which combined with 644 of the 2.5 to 4-mag quake events represents the high watermark of earth-change activity for determining the time of the Sun-Earth-Black Star nearside-alignment quake event. While Jupiter influence may be the culprit in producing what appears to be an early-alignment event, my suspicion from doing hours of research this week is that possible mistakes have been made in the way weeks have been added to the end of each orbit cycle. Look above at Week 53 for 2017 to realize 7 days were added to the calendar year giving us 371 days (52 x 7 = 364 + 7 = 371. The same adjustment was made to end the 2016 orbit cycle that also contains 53 x 7 days. Then, go back to revisit the 2014 and 2015 Seismic Charts to realize both of those orbit cycles have 54 weeks or 378 days each. Two weeks were added to those orbit cycles, because the Black Star was moving left in the orbit diagram an average of 12 degrees, or just under two weeks. Since 52 “charted” weeks equals 354 days, then approximately 1.2 days were lost and added to the next orbit cycle, as part of the charting process. 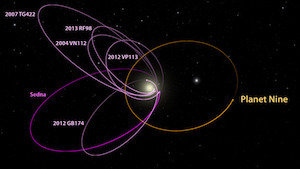 However, the Black Star began making smaller-incremental moves left in the orbit diagram/solar system around the “pivot point” determined to be April 25, 2015 (7.8 Nepal from the Black Star Event Timeline), but today that pivot-point location is in question along with other aspects of the Project Black Star Investigation. We must learn from Earth testimony in this case in combination with known factors established during previous Earth orbit cycles. Those following the weekly reports already know that my predictions about Earth seeing 8 and 9 new volcanic eruption events came true and in the month of May 2018, when Earth passed between the Sun and Black Star. Go back to Newsletter 18 (link) to realize Earth saw 9 new volcanic eruption events leading to the 6.9 Hawaii Quake in Week 11, which tells me that the Black Star-Earth magnetic portal connection was at the minimum length in early May 2018 and not in the middle of the month as projected. While more analysis is required for drawing conclusions, the evidence suggests that Earth has passed the Black Star in natural orbit around the Sun with clear signs that the earth-change lull period has already started. 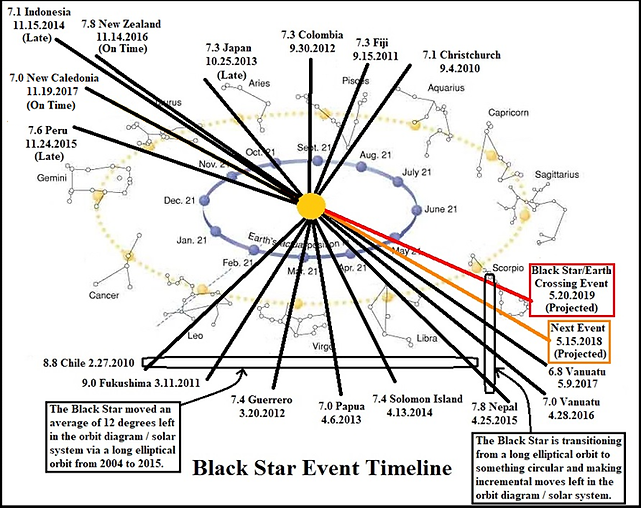 My suspicion is that the Black Star is moving slower left in the orbit diagram than realized and that at least one orbit cycle (maybe two: 2013-2017) includes too many weeks, which means the 6.9 Hawaii Quake really struck in Week 12 or 13 of 2018. Earth will move through the next key-marker position in August 2018, when global seismic-volcanic-event values should reach a minimum. We identify that key week to then count the weeks backwards for identifying the center point, which should identify Hawaii as the anticipated Sun-Earth-Black Star nearside-alignment quake event (N) for the 2018 Earth orbit cycle. We are looking 2.5+ magnitude earthquake events for the last 7 days, which no longer reveal a seismic pattern associated with deep magma plume activity (article and map) from Earth mantle transition zone(Wiki) at the 10-kilometer depth. Only two-deep earthquake events have struck Earth in the last seven days on the Fiji-side of the Indonesia-Fiji Seismic-Volcanic Origination Zone, which is another sign that Earth has already passed the Black Star in natural orbit around the Sun providing more evidence that the first earth-change lull period for the 2018 Earth orbit cycle is already underway. The tall stack of flags marking the Hawaii Quake Swarm Area is responsible for the high number of 2.5 to 4-magnitude earthquake events that has no precedent since the investigation started in January 2011. Deep earthquake activity on the Indonesia-side of the Indonesia-Fiji Seismic-Volcanic Origination Zone, and Buoyancy-Barrier Corridor 1 has disappeared completely. We are looking at more evidence that Earth has already moved through the peak of the first earth-change uptick period for the 2018 Earth orbit cycle relative to the Black Star in the Libra Constellation. Earth is now heading towards the 90-degree position relative to the Sun and Black Star, which should come 91 to 93 days following the nearside-alignment quake event currently recognized as May 4, 2018 with the 6.9 Hawaii Quake Event. If the earth-change low watermark comes later than projected, then we could be looking at evidence of Jupiter’s solar-system-harmonics influences causing the nearside-alignment quake event to show up early in the seismic chart. In other words, the 6.9 Hawaii Quake and volcanic eruption events might have taken place on May 15, 2018, if Jupiter was behind the Sun relative to the Black Star on the far side of the solar system. 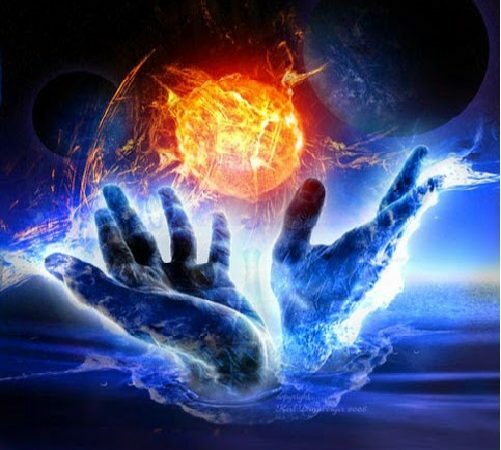 In fact, Saturn-Jupiter’s influences may be throwing us an electromagnetic curveball and throwing us off the track for identifying a May 20, 2019 Black Star-Earth Crossing Event that would include a Black Star-magnetically-induced geological pole shift. However, if May 4, 2018 is the true Sun-Earth-Black Star alignment date “and” the May 20th Black Star-Earth Convergence Date is also true, then the Russians might be right and we could be looking at a 2020 or even a 2021 “event” (link). The bottom line here is that survivalists-preppers should be preparing for a “May Event” each and every year, while listening to the Earth for earth-pang testimony along with the global political/geopolitical/economic environment. The forecast is to see a decrease in global seismic activity between now and August 2018 with peaks and valleys showing up along the way. Kilauea is expected to have decreased seismic and volcanic activity now that Earth has moved beyond the alignment, but we must realize that the Black Star-Earth magnetic portal connection remains extremely short from Black Star-Earth near proximity; which means the potential for powerful eruptions remain in the cards for the coming weeks. The combined seismic data says Earth dodged the Black Star bullet for the 2018 Earth orbit cycle, as our planet has passed the May 20th Black Star-Earth Convergence Date. California and the US/Canada West Coast have also dodged the Deep Magma-Plume bullet, as the 600-mile differential-distance between the two-primary deep magma-plume formations has already started growing with Earth core expected to cool between now and August 2018. The projection is for the 600-mile differential value to be tested again, as the Earth passes behind the Sun relative to the Black Star in November 2018, when Jupiter and Saturn will play key solar-system harmonics roles with the Black Star positioned nearby in the Libra Constellation relative to the Sun. Earth saw just four new volcanic eruption events in the last seven days with two new eruptions in the Indonesia-Fiji Seismic Volcanic Origination Zone (Central Java and Papua New Guinea). The Kilauea predictions of continued volcanic activity have also come true, as the seismic-volcanic-pressure shift from Indonesia-Fiji through the Americas has intensified greatly moving through May 2018. The Reunion Island new volcanic eruption event appears related to recent seismic activity (like this and this) and deep magma-plume triggered part of the new global tectonic-volcanic dynamic along Buoyancy-barrier Corridor 4. The Earth is testifying about Black Star-Earth near proximity in early May 2018 with the weekly number of new-volcanic-eruption events now on the decline from eight and nine down to five last week and now four for this week. The predictive modeling from accumulated data forecasting a Sun-Earth-Black Star nearside-alignment quake event on May 15, 2018 did not materialize, because the Sun-Earth-Black Star nearside alignment came with the 6.9 Hawaii Quake earlier in the timeline than expected. Again, Jupiter’s solar-system-harmonic influences from the Libra Constellation could have caused this event to strike early, which means the Black Star can be farther left in the orbit diagram/solar system than indicated by the data and accumulated evidence in this case. We continue monitoring the earth-changes for evidence of decreasing global seismic-volcanic activity, which right now says the Earth already passed the Black Star in natural orbit around the Sun. The probabilities right now say the 6.9 Hawaii Quake (USGS) from May 4, 2018 is our Sun-Earth-Black Star nearside-alignment quake event, but again, my suspicion is that the Black Star is actually farther left nearer the center of the Libra Constellation relative to the Sun. Remember always that we are dealing with a gravitational-magnetic anomaly having a unique magnetic-repulsion relationship with our Sun (article) with the ability to fool everyone. 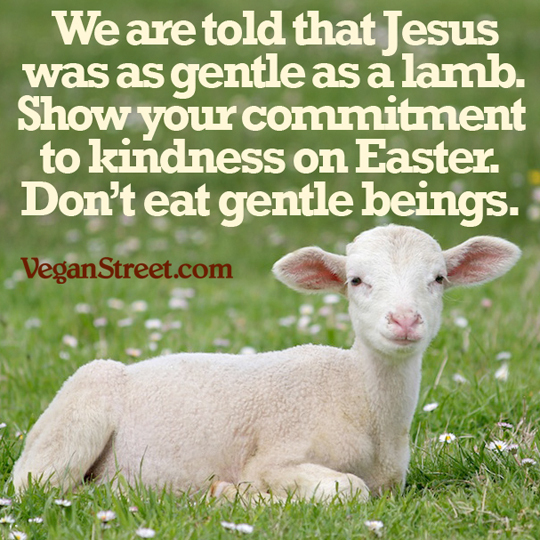 Read the Full Report and related articles, by subscribing to Terral’s 2018 Newsletter/Survival Group Programs at http://terral03.com/ for just two bucks per month. Non-Newsletter/Survival Group Subscribers can download last week’s complete newsletter using the complimentary link to Terral’s 2018 Newsletter Issue 20.